On a blue sky Sunday, 29th May at 2pm, Sydney Town Hall was packed with around 6,000 people keen to “March Against Mike.” The Corflutes on display were notable for their diversity; this was no ordinary protest march against something; this was a protest about pretty much everything, with NSW Premier Mike Baird being the one thing that binds them all. But is it fair to blame Baird for all of this? 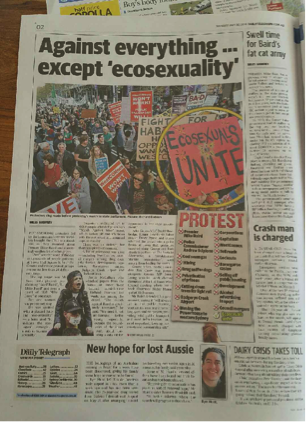 I joined the protest to find out more and to get a little publicity for my own pet cause of the moment with the good people from RAWSA (Residents Against Western Sydney Airport). So where and when did all of this anger start? A significant tipping point was reached with the forced council amalgamations earlier this month. 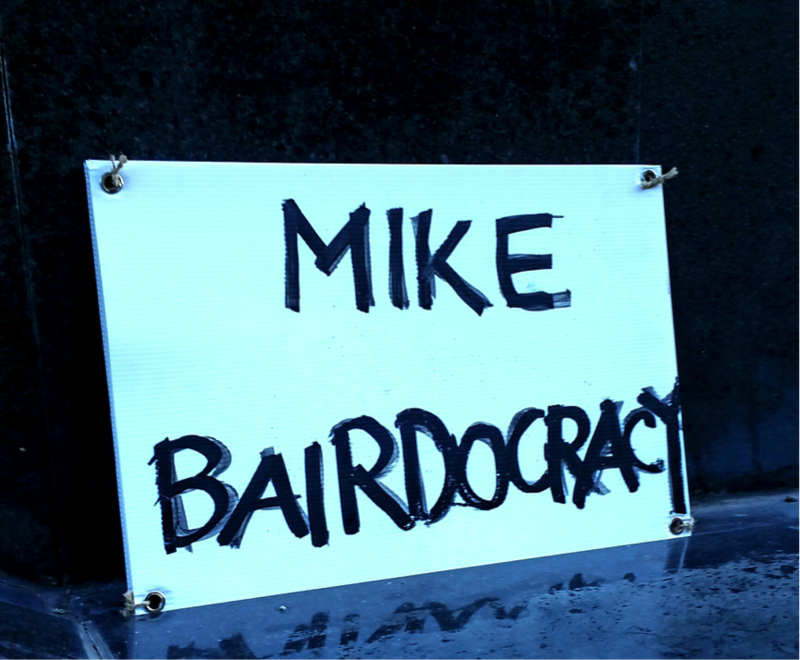 The week leading up to Sunday’s March Against Mike saw several council meetings disrupted by protestors as the new Baird-appointed administrators tried to take the reigns. Blaming Baird for this may well be justified given that he introduced the Fit For The Future initiative back in September of 2014 during his first year as New South Wales Premier. The reported aim of amalgamating councils was to cut costs and needless bureaucracy, streamline decision-making and deliver better services – a plan that is not without merit. However, what seems to have been forgotten amid this rush for efficiency is the role that local government plays in upholding democracy and the relationship and engagement that residents have with it. Clearly, Facebook “likes” are not to be seen as just a glowing endorsement. To Baird’s credit, he has allowed for a good variety of comments on his Facebook page, including many that are less than flattering. He has even answered some of the negative comments and was happy to be corrected by one reader who pointed out that Vivid Sydney was not a Liberal party initiative and that his party made an issue out of how expensive it would be. But back to the march, and more specifically what sat at the heart of public sentiment. It is all too easy to judge a protest by its one-liners. In fact, putting a negative spin on the actions of protestors has become something of a national past-time, supported to a significant degree by newspapers such as the Daily Telegraph, whose coverage of this rally went well beyond Right-leaning, taking every liberty to undermine the significance of the event and the legitimacy (and sanity) of those participating. It pays to remember that Australia is a representative democracy, founded in the liberal democratic tradition. That tradition is based on four main principals, including the belief in the individual, based on the idea that the individual is both moral and rational. It is also founded on a suspicion of concentrated forms of power, whether in individuals, groups or governments. Protesting has a legitimate and powerful role in the democratic process. Is the Baird government in danger of forgetting this? It was Premier Baird that has made tough anti-protest laws a priority, increasing police powers to lock-up people who they suspect might cause a problem, long before they ever do (if indeed they ever do). Therefore, it seems fair to march against Baird in protest of these changes. If there was one take-home message from the protest, it was the common thread of a feeling that people are no longer being heard, that the democratic process is somehow being corrupted and that their vote is not worth as much as it used to be. This feeling can be applied to the forced merger of local councils, to the secrecy in the detail of projects such as WestConnex, to the lack of compassion for, or negotiation with, those protecting the trees on Allison Parade in Randwick, to the brick walls being hit by residents in Windsor worried not just about the threatened loss of their historical bridge and town square but also about the “not for public disclosure” agenda that might be propelling the push and more. One doesn’t have to turn into a conspiracy theorist to think this way; one thing the Baird government can’t be accused of is being timid. Their bold approach to “getting the job done,” whatever it may take, means that those willing to put in the time to read and research behind the newspaper articles, to attend meetings, to talk to MP’s, can find evidence to support the very things that are making people stand up and march. McKinnon went on to mention Packer’s casino being built on public land at Barangaroo, with the crowd neither shy nor slow to voice their displeasure at what appeared to be the epitome of what they had come to protest. While I don’t feel it is fair to frame Baird as a one-man wrecking crew or a dictator, I acknowledge that it is no easy feat to unite Liberal, Labor, Green and swing voters, anarchists, tourists and children against you. Think about it – it’s no easy feat to get thousands of them to come out on a beautiful Sunday and march. So in regards to the question “Is Baird all bad?”, I say this: it is what comes next that matters. It is how Baird and his government respond to what was a legitimate and peaceful process, that will be the judge. Baird has after all a right to respond – and I for one am all ears.